Just in case you’ve missed it, Rincon-Vitova Insectaries of Ventura California has put in a sample Butterfly, Bee and Beneficial Insect Garden (B3 Garden). It is on the west side of the Ventura bike trail right alongside the Ventura River. It’s easy to miss, even when you work at the site like I do. Obviously, the B3 garden is there to attract butterflies, bees and other beneficial insects. 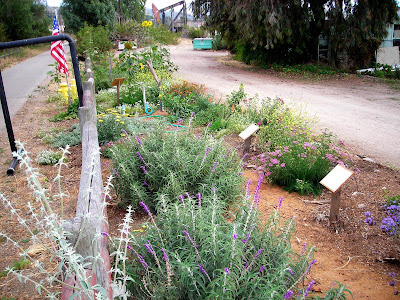 The B3 has drought tolerant plants with an increasing diversity of six-legged visitors, but it should attract you too. 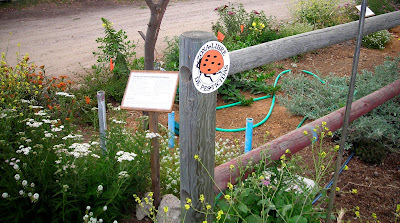 Most of the plants are labeled and there is additional information posted about garden management. During daylight hours, folks are always welcome to take a closer at the garden in order to spot butterflies and beneficial wasps and flies.